It’s true that Paul has brought important issues to the national debate. It’s also true that he’s a reactionary crank. 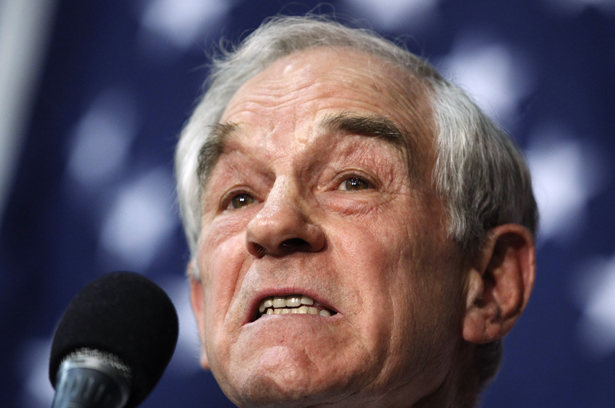 I was unfair to Glenn Greenwald in my last column (“Ron Paul’s Strange Bedfellows”). He did not call for progressives to abandon Obama for Paul because Obama supports nondefensive wars, drone attacks, high levels of military spending and the assassination of US citizens; has failed to close Guantánamo; signed the National Defense Appropriations Act (NDAA), which provides for the indefinite detention without trial of terrorism suspects who are US citizens; and vigorously prosecutes the “war on drugs.” Greenwald pointed out that Paul was the only candidate who is raising these issues, which were so crucial to progressives during the Bush years. That’s true; it’s also true that they will certainly not get attention on the campaign trail once Romney is the crowned candidate. We had a polite and mutually respectful discussion of Paul’s candidacy at Bloggingheads.tv. One thing Glenn and I agree on: Obama’s ban on torture aside, he has been a huge disappointment to anyone who was hoping that his election would mean an end to the violation of the civil liberties, due-process rights and human rights of detainees in the “war on terror.” His refusal to prosecute the architects of torture in the previous administration may have been politically astute (we on the left tend to forget that Obama was elected with plenty of votes from Republicans, independents and conservative Democrats who liked his rhetoric of bipartisanship and national unification). But it has meant that those policies were never confronted, debated and decisively rejected, and the people who put them in place and carried them out were never called to account. Lynndie England went to prison; John Yoo is teaching law at the University of California, Berkeley. As David Cole wrote in The Nation recently, Bush has been gone for three years. Having signed the NDAA, however reluctantly, Obama now owns those policies, if not the sadistic triumphalism that was the characteristic note of the Bush era, and so do we all. People are even willing to give the government license to kill its own citizens: Anwar al-Awlaki was an American, and his assassination was widely applauded. Paul is one of the few nationally prominent people to have criticized it (along with the assassination of Osama bin Laden). That the president can now order the assassination of US citizens anywhere in the world has become part of the national wallpaper. It’s the way we live now. These are important issues, and I’m glad Glenn follows them so energetically—and I’m glad someone, even if it’s Ron Paul, is talking them up in the campaign. But let’s not go crazy here. They are not the only issues. It makes no sense for progressive pundits who have devoted their lives to defending the welfare state, progressive taxation, labor unions and the federal government’s ability to protect citizens from abuses at the state level to heap praise on Paul, who vigorously opposes all those things as part of his Ayn Randian anti-government, every-man-is-an-island worldview. It is a fact that most of these pundit fans are white men (not all of them, obviously, as has been pointed out by literal-minded readers), as are (again not exclusively, but predominantly) Paul’s supporters. There are probably numerous reasons for this, but in my opinion, one of them is that some of the areas in which Ron Paul is truly awful are just not politically central to them. (Note by contrast feminist civil libertarian Wendy Kaminer’s carefully parsed discussion of Paul in The Atlantic.) You can’t praise Paul’s stance on “civil liberties” as pure and uncompromising if you see reproductive rights as a civil liberty. You can’t celebrate Paul for bemoaning the effect of the drug war on black America without noting that criminalizing abortion would put a different set of black people into the criminal justice system—not low-level drug users and dealers but ordinary women, mostly mothers. To those who say abortion rights are safe so Paul’s position doesn’t matter, I would suggest a brush-up on recent state developments. We are much closer to criminalizing abortion in the South and Midwest than we are to legalizing crack and heroin anywhere in the United States. And to those who say segregation is a dead letter, I’d say it’s not at all fantastic to see popular libertarianism tipping the balance in favor of allowing landlords, hoteliers, restaurant owners and such to exclude people on racial grounds. Informally, it already happens. It’s not only that the messenger discredits the message—Paul’s wacky statements are not ancient history; just recently he told an evangelical gathering in South Carolina that the gold standard is mandated by the Bible. It’s that the message itself discredits the message. There has to be a better way to argue for diminishing America’s huge global military footprint than by connecting it to an isolationism so extreme it would mean quitting the United Nations and abolishing foreign aid, and a better way to protect civil liberties than by opposing them to civil rights. Positions don’t exist in isolation, either from who is advocating them or who is listening. Context is all. And the extreme-right, anti-government libertarian context is bad news for the left. As I said before, Paul is a reactionary crank, and by branding with his name positions that plenty of progressives take, we inadvertently strengthen the case against ourselves.